← Ryan Braun: Rushing to Judgment ? As the year comes to a close, so too does the last United Cardinal Bloggers project: The Top 5 Stories of the year. With an improbable World Series Championship, an early season injury to Adam Wainwright, the trade of Colby Rasmus and the departure of Albert Pujols to the AL West taking all of the attention, there are many other stories that captivated me during this year. Here are my top 5. In this case, I am referring to the return to form of Kyle Lohse. Over the last two years, Lohse has become something of a punching bag, absorbing the brunt of our disappointment since the horrific sweep by the Dodgers in the 2009 NLDS. While Lohse has never been a dominating top of the rotation pitcher, he has been a steady contributor. When he sat out following the 2007 season, hoping for a big free agent deal, and none came his way, he signed an insignificant contract with the Cardinals half way through spring training. He turned in a career year in 2008 and was rewarded with a 4 year extension. Then the injury and the subsequent disappointment. It led many to question his contract, perhaps many more wishing the Cardinals would just give up on Lohse and eat the remainder. But guess what, the guy was really injured after all. No, it was not some sort of phantom ailment, but a legitimate injury that an unprecedented surgery repaired. 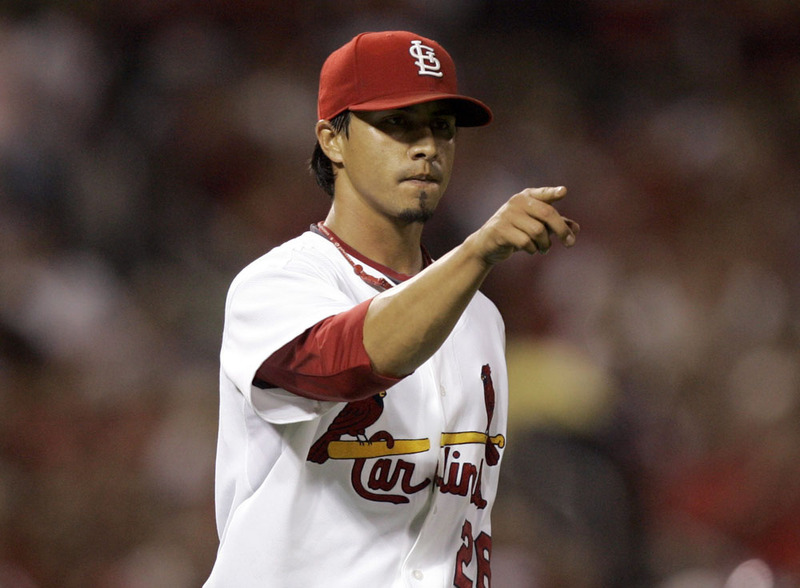 Lohse was spectacular in spring training, displaying a control that he had only hinted at before. For a pitcher that doesn’t have a swing and miss fastball, that control is the difference between winning and losing – and he had it back. He jumped out to a 7-2 record by the end of May before running into a bit of trouble in the middle of the season. Chris Carpenter got all of the attention during the August and September wild card chase, and rightfully so, but let’s not forget that Lohse went 5-1 (the Cardinals 7-2 overall) during those last 2 months. Several times during the season, he got unto trouble early, but somehow corrected himself and held the opposition at bay until the cavalry arrived in the later innings. This was not just one or two isolated situations, but happened once a month or more. For a pitcher that fans wanted to run out of town, Lohse ended up leading all of the Cardinals starters in Wins, ERA (yes, ERA), fewest hits per inning pitched, fewest walks per inning pitched – and yes, if you add those up, he led the starters in WHIP (walks and hits per inning pitched). Nice comeback, Mr. Lohse. We’ll take another season, just like this one, in 2012. At 6ft 5in and 250 pounds and a sporting a beard that we haven’t seen since Merlin Olson played Father Murphy, Lance Lynn was one of the most pleasant surprises in the 2011 season. Yes, the Lance Lynn that many thought didn’t throw the ball hard enough to compete in the major leagues. I guess they missed his 16 strikeouts during the AAA playoffs on September 10, 2010. As it turns out, Lance Lynn can get the ball into the upper 90s and with a lot of movement. After getting hit hard in his major league debut, he held opponents to 1 run or less in 16 of his next 17 appearances, including one start. Before he was injured in early August, he had taken over the late setup role and had even saved a game, perhaps an audition for closer in 2012. Oh, this is all great stuff – but the best is yet to come. With all of the minor league seasons finished, and no place for a rehab assignment, Lance Lynn pulled off the unimaginable – returning to the bullpen in the NLCS cold. Well, cold is probably the wrong word to use because the man was on fire. After coming off the 60 day disabled list (that’s over 2 months), he appeared in 5 NLCS games and another 5 in the World Series, winning one game in each. He did not allow a single ru in the NLCS, and was nearly as good in the World Series. 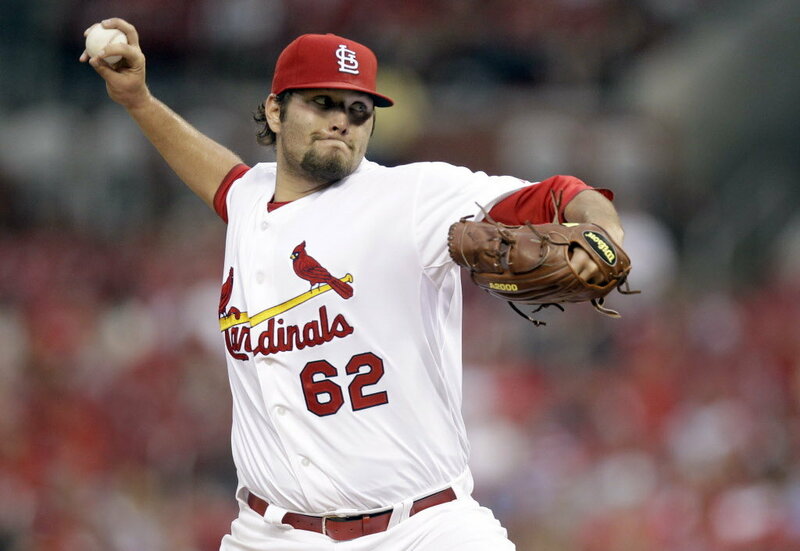 I am really looking forward to seeing Lance Lynn pitch in St. Louis next season. He has a very bright future and could become a part of a young core of starters which might make baseball very exciting for the rest of the decade. With 162 games in the regular season, another 18 in the postseason, there were two that stood out among the others. I will get to the other one in a moment. For my number 3 story, I am talking about the next to last home game of the season. The date was September 24 and the opponents were their division rivals, the Chicago Cubs. Time was running out and the Cardinals were hanging on to a slim mathematical chance of winning the NL Wild Card. With Kyle Lohse on the mound, the Cardinals fell behind quickly in the first inning. I wish I had kept some of my Twitter timeline from then – it would have been fun to go back and read the reactions at the time. The part of the story that has been forgotten was that Kyle Lohse then set down 18 of the next 21 batters he would face. 3 singles was all he would allow, and never more than one in an inning. In his last inning of work, he would strikeout the last two batters, giving him 8 on the afternoon. Talk about doing everything you can to give your team a chance. Then came the parade of relievers: Octavio Dotel, Marc Rzepczynski and finally, Jason Motte. Carlos Marmol takes over for the Cubs, hoping to protect a slim 1-0 lead in the ninth inning. Lance Berkman flies out to start the inning – one out. Matt Holliday hits a rocket of a single and is replaced on the bases by Tyler Greene. Greene immediately steals second base, and goes on to third when Cubs catcher, Giovanni Soto throws the ball into center field. David Freese looked terribly overmatched when he struck out – 2 outs. The Cardinals were down to their final out, perhaps for the season. Yeah, right – I watched Game Six of the World Series too. 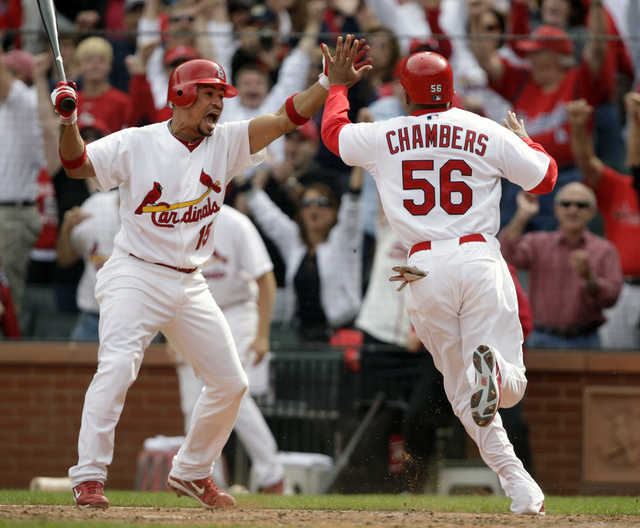 Yadier Molina patiently draws a walk and is replaced by Adron Chambers. Skip Schumaker also patiently draws a walk to load the bases. Suddenly, Carlos Marmol can’t find the strike zone. Ryan Theriot works the count full, and on a 3-2 pitch, he holds his breath and watches the Marmol pitch just miss on the outside corner. Tyler Greene trots home with the game tying run. Not even Rod Serling could have imagined what happens next. With Rafael Furcal standing in the left handed batters box, Marmol throws a ball down in the dirt and at Furcal’s feet. The ball shoots all the way to the backstop and Adron Chambers comes in to score the game winning run. This was the most exciting regular season game since Terry Pendleton hit a two run home run to dead center field in Shea Stadium in a similar situation in 1987. Both games still give me goosebumps when I think about them. For Andrew Brown and Shane Robinson, the Triple A game between the Memphis Redbirds and Iowa Cubs on April 16, 2011, lasted just a few minutes. On the third pitch of the home half of the first inning, Tony Campana of the Iowa Cubs hit a looping line drive to left-center field. Left fielder Andrew Brown and center fielder Shane Robinson both gave chase. With their arms extended to make the catch, the two collided violently and immediately fell to the ground. Pete Kozma retrieved the baseball and the play ended, with Campana ending up at second base. Courtesy of our friend, Bill Ivie, you can see the play right here – but please be advised, this is a very violent collision. If you have an MiLB.TV subscription, the archive of the game is available. The play takes place at the 8:10 mark in the broadcast. Brown and Robinson collided, hitting head to head. Due to the angle that each was taking to the ball, Brown took the hit to the side of his head. He was down for several minutes, but was able to get up and leave the field on a cart. The cart took him to the team’s training area where he was examined. Robinson, the smaller of the two outfielders, took the full force of the collision with the front of his face. He was down on the ground for over 13 minutes. He was able to get up and left the field on the cart, not on a stretcher. The Iowa Cubs fans in attendance cheered the Redbirds center fielder as the cart departed the field for the parking lot, where an ambulance would take him away to a nearby hospital. The game was interrupted for a total of 16 minutes. For Robinson, this is another in a long line of injuries that has plagued the young man’s minor league career. 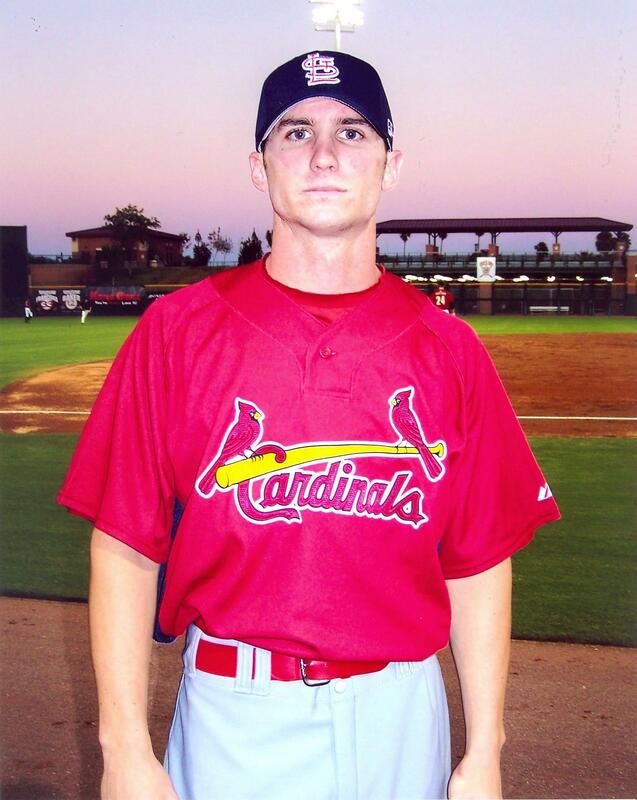 A foot injury in 2007 cost him 47 games in A ball, and a separated shoulder limited him to just 26 games with the Memphis Redbirds in 2010. In both cases, he seemed to have recovered without missing a beat. He was off to a hot start in 2011. In 6 games, he was 8 for 20 with 2 doubles, a triple and 6 RBIs. That works out to a .400 batting average and .600 slugging. Add a couple of walks to up his on-base percentage to .435, and he was off to a nice start – small sample size notwithstanding. This story has a very inspirational ending, and that’s why it makes the second spot on my list. Not expecting to ever hear the name Shane Robinson again, I was surprised when he was interviewed by Memphis broadcaster, Steve Selby, a few weeks later. He talked about his injuries and that what that he expected to be back with the club before the end of the year. Just as we were learning to do with the big club, fans were about to learn that they should not underestimate the young outfielder. He did indeed start a rehab assignment in Palm Beach a few week later, eventually returning to the Memphis Redbirds. As Adron Chambers struggled late in the season, Robinson actually took over center field duties and got quite a bit of playing time in the process. Robinson’s Cinderella story became complete on September 2 when he was added to the 40 man roster and he joined Brandon Dickson as one of the first minor league callups. Unfortunately, he went 0-7 in the month, but he was effective as a late inning defensive replacement. A most improbable end to a season that started off so badly. That could be said about so many aspects of the 2011 Cardinals, but Shane Robinson’s contributions hold a special place among all those great stories. That brings us to the number one story. October 7, 2011. Game Five of the NLDS. Elimination for one team, and it was being played in one of the most hostile ballparks in baseball. Chris Carpenter and Roy Halladay, former teammates, close friends and now ultimate competitors. Chris Carpenter had been the dominator, but is certainly well into his declining years. Halladay is at the high point of his career. On paper, the Phillies should win. Easily. Fortunately for Cardinals fans, baseball is still played on the grass and not on paper. The Phillies line score says all that you need to know about the game. 0 runs, 3 hits, 2 errors. 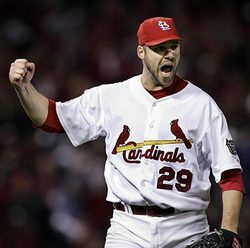 Chris Carpenter pitches the game of his career, perhaps the best since Danny Cox in Game Six of the 1985 World Series. For all of the ups and downs in Game Six of the World Series, that was actually a poorly played game. This one was the exact opposite. This was old school pitching dominated baseball the way that Seaver, Koufax and Gibson used to do it. This game was perfection, and it sent the Cardinals on to face the Brewers in the NLDS. Those were my favorite stories from 2011. Agree or disagree, let me know in the comments. And please, share some of yours. This entry was posted in 2011 Season, United Cardinals Bloggers. Bookmark the permalink. Thanks, Tena. It’s hard to believe that it was 43 years ago, but I still remember Denny McLain vs Bob Gibson in Game One of the 1968 World Series. I think we will be talking about the Halladay/Carpenter game last October for at least that long. I can watch that game over and over again, and I’m still amazed. There are only a handful of games in my life that were as good as that one, and we got a chance to experience it. Unbelievable.